Why so expensive! Is Hyderabad's Comic-Con losing its charm to pricey tickets? Since most Cosplayers from the city are students, some still in school, they save pocket money and try to procure cheapest materials to create their costumes. HYDERABAD: Over the years, Comic-Con Hyderabad has not only grown in popularity but, unfortunately, has also become dearer to the disappointment of fans. From the inaugural edition, held back in 2013, when the ticket were sold at Rs 300, there has been an increase in the price of tickets. 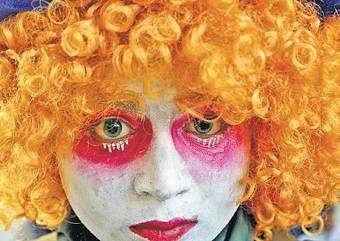 This year, the organisers have decided to price at the daily tickets at Rs 500, a move that has not gone down well with fans as well the Cosplayers. Cosplay, the most sought-after aspect of the Comic-Con, may have seen new entrants like Black Panther or the Classic Joker, Samurai Captain America, Thor, Iron Man, Charlie, Hulk and Hela, however, the general response was that of disappointment. While cosplayers state that it is an art that requires effort, practice and resources both in terms of time and money, the additional costs that they incur on account of pricey tickets and lack of sufficient facilities at the venue is pinching them. Zoya Ahmed, who cosplayed anime characters Makota Nijima of Saturday and will be Kashuu Kiyomitsu on Sunday, from Persona 5 and Toukin Ranbu respectively, said she spends over Rs 5,000 on her clothes and accessories and the price of the tickets and transportation are additional costs which they have to bear. “Not every geek can afford that kind of money this hobby demands and Comic Con isn’t being very helpful in this regard,” Zoya, who is a medical student, said. In 2016 if people bought tickets for two days they were given some discount. The following year, the prices of tickets not only jumped up and became Rs 550, but the organisers have also done away with the discount. “There was a lot of hue and cry from participants and we had hoped that this year it would be better. But we are made to pay as much as the visitors and not even provided with complimentary food. They are driving cosplayers away,” said Iron Man aka Tejodeep, a UG student. Since most Cosplayers from the city are students, some still in school, they save pocket money and try to procure cheapest materials to create their costumes.